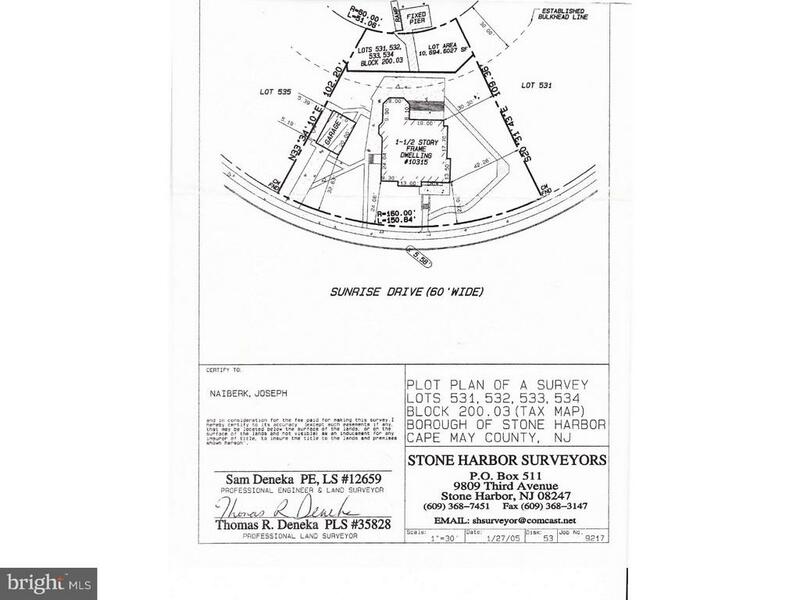 All Stone Harbor homes currently listed for sale in Stone Harbor as of 04/20/2019 are shown below. You can change the search criteria at any time by pressing the 'Change Search' button below. If you have any questions or you would like more information about any Stone Harbor homes for sale or other Stone Harbor real estate, please contact us and one of our knowledgeable Stone Harbor REALTORS® would be pleased to assist you. "Special Opportunity, 2nd from the Beach Stone Harbor Property! Custom designed and built home that features Ocean views from the 1st floor decks and bedrooms, tremendous views from the front and back 2nd floor decks and from inside the home. Come hear the Ocean for yourself and feel the Ocean breezes. The home is 4-5 bedrooms, 3.5 baths with a first floor entertainment room with coffered ceiling that could be utilized as another bedroom. Custom finished on site weathered oak wood floors throughout the home as well as shiplap interior wall accents and upgraded trim package. First floor has 3-4 bedrooms and 2 baths, one of which is en suite as well as a wet bar area with extra fridge for beverages. The first floor also has 10' ceilings and transoms above the bedroom doors. The second floors opens up to a large kitchen area and center island. The kitchen features custom cabinets, stainless steel Thermador appliances, beverage fridge, fantasy white quartz tops and seating for 5 that allows you to see the ocean. The dining room table allows for more ocean views and seats 8, the living area has custom built in shelving, comfortable seating and more views of the Ocean. The master bedroom off the back of the 2nd floor features its own bath, his and hers closets, a large deck and impressive Ocean views. The rooftop deck affords a retreat area to take in even more pleasing views. The exterior of the home features Ipe wood decks, custom flower boxes with automatic watering system, hardiplank shingles and azek trim.In ground pool with outside cabana wet bar and TV. From this location you are walking distance to playgrounds, recreation fields, dining and the bay. Enjoy the 4th of July fireworks from your deck in this professionally appointed home at the beach, ready for you and your family to make memories. Next door ocean front home completed in 2018 Less"
"Build your dream home on this over sized bay front lot! Excellent sunset views on Stone Harbor Basin, boat dock, lots of extra street parking are some of the great features of this site."